For most, you might achieve an adrenaline rush by running a road race or taking on the steepest mountain bike trail. What those endeavors have in common is that your feet, for the most part, are firmly planted on terra firma. If these activities don't quite do it for you, here are some suggestions for getting yourself off the ground to achieve that elusive rapid heartbeat. The sport of bungee jumping has arrived in Central Oregon with the option to jump from the Peter Skene Ogden State Scenic Viewpoint. Operated by the Oregon Parks and Recreation Department, the historic bridge, which opened in 1926 and spans the Crooked River just west of the relatively new Highway 97 bridge, until now served as a pedestrian walkway. 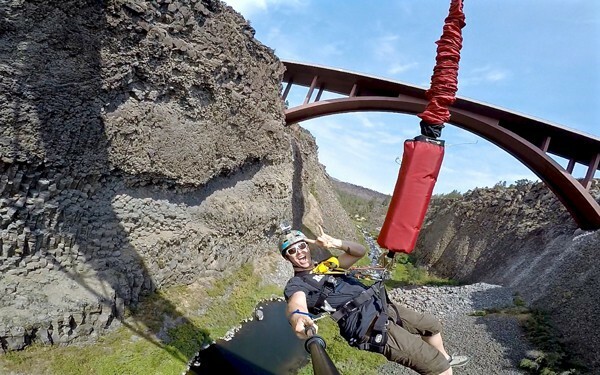 An agreement between the parks department and James Scott, owner of Central Oregon Bungee Adventures and a longtime jumper, BASE jumper, and skydiver, now makes this option available for those that dare to jump from the viewpoint at a place where the river floor lurks 300 feet below. Jumps are weather permitting and those seeking this adventure are urged to call 541-668-5867 for availability. Head over to Warrenton for a first-time paragliding tandem jump from either a coastal beach tow or a mountaintop in the Tillamook Valley area, the Columbia Gorge, or Ecola State Park in Cannon Beach. Discover Paragliding provides newcomers a ground school session to introduce the fundamentals of paraglider control, launching, and landing. After a few minutes in their "flight simulator," you'll be ready for your first flight. Depending on weather conditions, you might be allowed to take control of the glider and, with a little coaching, actually fly your "wing" yourself. Have no fear, as you return to Earth your instructor will take the controls for the final approach and landing. Still not satisfied? Then head to Molalla and Skydive Oregon to experience jumping out of a plane, on purpose, at a minimum altitude of 13,000 feet. Taking off from a private airport brings you and your instructor up for a 120mph free-fall experience before opening the parachute for a slightly more controlled five-minute ride back to the landing area. Although you are just along for the ride, this thrill-ride requires customers to be in reasonable shape, described by Skydive Oregon as "height and weight proportionate according to the NIH's BMI index." Be sure you have four to five hours for the experience. Visit skydiveoregon.com for more information.